As one of the UK’s leading food manufacturers, Quattro Foods supplies the highest quality fresh and ambient foods to the retail sector, food service providers, restaurants – both independent and high street chains, the NHS, the Armed Forces and schools. Each sector has totally different needs, and the Quattro chefs have to be creative with their bespoke menu plans and products. How do they cater for schools with low sugar requirements? How do they ensure NHS patients get sufficient nutrients without compromising on taste? How do they create bespoke and relevant sauces for ethnic restaurants? We spoke to Quattro’s master chef Tony about how he and his team customise their products for every sector. Q. Do Quattro’s customers from different sectors have very different needs? A. Indeed they do. For example food service customers serving the City of London’s office lunch set, tend to opt for either the fit food at the healthier end of the market, so dishes with restricted calorific values per serving, or pure indulgence with a particular cultural slant such as rich and luxurious sauces for pasta. Q. Could you please give examples of different sectors and what they ask for? Requests for good quality, healthy, luxurious or trendy food on the go or at work are in great abundance and vary from soups to curries and other foods from around the globe. Another example is fit & healthy food to suit the health conscious, such as vegan or vegetarian dishes under 60kcal per 100gm serving. Students and indeed staff, are always on the lookout for the latest street food trends, or a signature dish similar to those that they can buy from their favourite eat out destinations, such as spicy marinated chicken, or a tasty burrito filled with a good spicy chilli. The needs around this sector are for patient recovery, so food must have good calorific values and high protein content. Dishes such as ambient nut free pesto and ready to use curry sauces are designed to help the line chefs in lesser skilled kitchens perform with ease. Q. How does the care home market differ from other sectors? A. 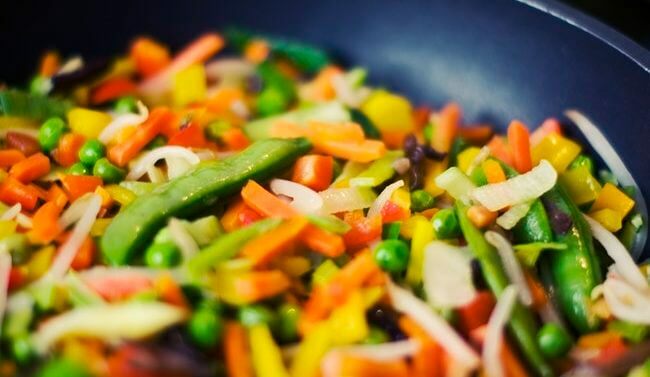 Care homes use a combination of healthy foods with high nutritional values in standard dishes, or indeed in “reformed products”, where a meal is processed to look like if it were for example a pork chop, but is soft textured to allow for easier digestion. Q. How do you balance the nutritional requirements of patients with the high levels of taste and quality that you offer other customers? Q. How do schools differ from other customers? A. Schools require healthier and more balanced dishes, therefore recipes require much more thought, in order to present dishes that taste great and keep up with high street trends, as well as having the feel that they are made at home! Q. Are you required to create low sugar meals? And if so, how do you compensate for taste? A. We produce a lot of dishes with no added sugar in the recipes, where we use the natural sweetness of vegetables, for instance, to produce the sugar rush as it were. Q. Do you have to be more careful with allergies when serving schools and care homes? A. No is the short answer, as we have to screen all ingredients we use for any allergens, regardless of the sector we are producing for, and we then have to clearly inform customers of the allergens and adhere to strict labelling and handling practices. We produce several soups, sauces and other dishes containing absolutely no allergens whatsoever, which is a real winner with some customers! Gluten free is probably the highest placed request. Q. Please could you tell us how you service each sector individually, ie providing sauces for restaurants, etc. A. We provide each sector with bespoke products and in bespoke packaging, such as ambient curry sauces in two litre tubs and fresh chilled pasta sauces in 2kg “pillow pouches”. We can meet the needs of all sectors, segregating production to enable us to deliver a huge variety of bespoke products. We treat each customer individually, rather than just the sectors, offering a bespoke service to make sure every customer has a unique offering, within the trends of their market. Q. Have you noticed a change in the requirements of different sectors over the years? A. Most definitely, but they all seem to follow trends as well. Nutritional values and allergen free, healthy and balanced choices have risen across all sectors. Q. How does Quattro continue to innovate? A. We do a lot of research and development to keep up with the times and trends, but we also like to put our little twist or mark on dishes as well. Q. What makes Quattro a market leader when it comes to variety and servicing customers with unique requirements? A. I believe that it’s our skill set, abilities to react and respond, providing a bespoke service and a full understanding of customer needs. Q. What is the future of custom-made food solutions? Is our changing environment playing a part in what customers want and what you can offer? A. I would use the phrase “tailor made solutions”, as that is what we provide, but our changing environment and the way in which we decide on food choices are definitely playing a part.